Jimi Hendrix (1942-1970) was a Seattle-born rock guitarist, who pioneered the modern sound of the electric guitar. Johnny Allen Hendrix (later renamed James Marshall Hendrix) was born November 27, 1942, Seattle, Washington was an American guitarist, singer and songwriter. Jimi Hendrix is recognized as perhaps one of the greatest and most influential guitarists in rock music history. He is often referred to as a musical genius. After success in England, he achieved notoriety following his 1967 performance at the Monterey Pop Festival. 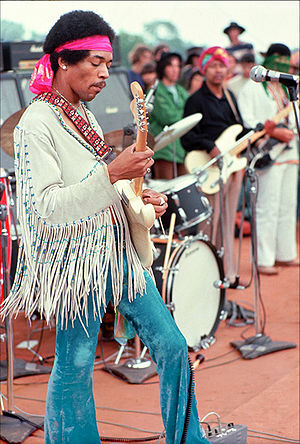 Later, Hendrix headlined the iconic 1969 Woodstock before his death in 1970, at the age of 27. He was found dead in a London hotel room in 1970 after aspirating on his own vomit; he is believed to have been under the influence of barbiturates at the time. He is most famous for his performance at the infamous Woodstock rock festival of August 1969, where he performed a psychedelic rendition of the National Anthem using audio feedback and other effects to produce the sounds of battle and helicopters, and for his singles "Purple Haze", "Crosstown Traffic", "Foxy Lady", and "All Along the Watchtower" (a cover of a Bob Dylan song). Rolling Stone Magazine named Hendrix number 1 on their list of the 100 Greatest Guitarists of All Time in 2003. This page was last modified on 26 September 2018, at 12:48.